The First is the worst. 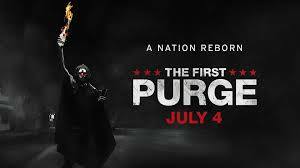 In what started as a home invasion thriller, The Purge series has turned into an attempt to make a current political or social statement with the sequels and now prequel. Unfortunately, the latest installment in the series falls flat from the start. Let me inform you of the paper thin plot: The government decides to do an experiment to cure the overcrowding population situation by turning Staten Island into its guinea pig. Citizens are offered financial incentive to stay on the island and are paid more to participate in the experimental purge. The focus of the experiment is a less wealthy, urban area of Staten Island. This gives the filmmakers a reason to insert crappy hip-hop music into the film. I won’t give anything else in the film away, but I’ll say this, anyone with common sense and half a brain will know who lives and dies within the first five minutes of the movie. The cast is made up of virtually all unknown actors and actresses besides Marisa Tomei. She must have really needed a paycheck. What makes The First Purge even more disappointing to me is the fact that with just a little bit of work and creativity, the film could have been entertaining. The writers and director are no doubt trying to make a social statement about the world today, but are just too lazy to do it correctly. The First Purge is nothing more than a cash grab and offers no redeeming qualities or entertaining parts. If this is what our movie-going experience has come to, I think I’ll just stay home. I’d rather binge and purge than sit through another Purge film anytime soon. The First Purge gets an F.